To me, trying a new drumstick is an exercise I find both enjoyable and very beneficial. I think drumstick design has a real impact on the way I play, and test driving different options always gives me a little more insight into what works for my hand and what doesn’t – or even what works for me right now. Different sticks make my hands work in different ways, and I always enjoy that kind of exploration. For that reason, I’ve always liked signature sticks. I think they give you a better idea of how a particular artist might actually play – how they physically approach the instrument – than any other piece of signature gear. In the worst case, you spend eight-ish bucks on a fun little fieldtrip into the mind of that player. Best case? You find a new stick that fits your hand and style perfectly. 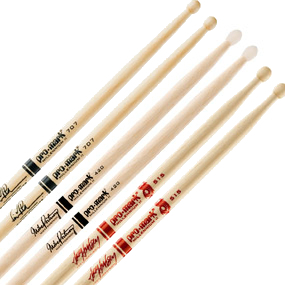 Compared to the rest of the equipment on your drum set, sticks are cheap. Why not explore the options available to you? Even if you wouldn’t count a certain drummer among your favorite players, their stick might be exactly what you’ve been searching for. Maybe that’s an overly sales-y introduction for this review, but it’s something I’ve always thought to be important, and I wanted to share. Alright, enough of that. Let’s move on to the review. The good people at Promark were nice enough to send over three of their most popular autograph models for review. The sticks were designed by three of the most prominent prog and metal drummers of the past thirty years – Simon Phillips, Mike Portnoy and Joey Jordison. Interestingly, despite wearing the names of some historically heavy players, all three models trended toward the slimmer side. I found that surprising when thinking about the huge sound associated with each of the designing drummers (even Phillips, with all his finesse, has long toured with prog and rock outfits that demand a good bit of volume). With no stick exceeding .551” in diameter (roughly the width of a Promark 5A), it seems that each model pulls extra punch and volume from assets other total mass – namely front end weight and above average bead sizes. It’s an interesting design theme that sets these three sticks apart from many of those produced by similarly gifted shredders. Let’s take a look at how they measure up individually. With the longest taper of the three sticks I received for review, the Phillips model offered the fastest rebound. Coupled with its extra length and large ball-shaped tip, the stick had a very fluid feel when I played doubles and mixed figures. That larger tip wasn’t super pleasant on thin cymbals, but it really hit the spot on rides of a medium or heavier weight, producing a full, round ping with lots of spread underneath. The TX707W really killed on toms with a low-tuning. I’ve got to imagine that was the result of the slightly thicker than average neck and extra weight up top. Every stroke pulled a big, heavy “whump” out of my toms without choking the sustain (as some heavier sticks can). The stick had the right balance of weight and front-end attack to allow for clear tone even under hard play. I found myself favoring the Phillips model as it felt most like a 5A, but with a little extra meat on top. If you feel comfortable with a 5A, but would be interested in a stick that does a little more of the heavy lifting for you, the TX707W might be the answer. The Portnoy stick was the only one in the batch to feature a nylon tip. The large oval bead gave me a crystal clear tone with a focused follow-through on every cymbal I tried. I’m not normally a nylon tip guy, but the combination of the TX420N’s slim handle and beefy neck created a great combination of finesse and power, which seemingly maximized the tight, bright response nylon is noted for. The heavier, shorter taper resulted in a throw with less rebound, but a bit more control on the upstroke. I’d say this is a great design for players who really like to manage the response of every note from start to finish. It’s a good, sturdy feeling really suited for heavy back beats and clear, defined tom figures. The .531” diameter really brought the weight of this stick down, making it ideal for lengthy performances. Of all the sticks in this group, I think it served as the best example of the power without size theme I mentioned above. I used the TX420N at a few very loud rehearsals, and I had no problem pulling the big sound I needed out of my kit with a stick that was a little smaller than what I’m used to playing. It’s a smart design that should work well for a lot of drummers working in heavier mediums. The former Slipknot skinsman’s signature stick featured a .551” diameter with a quick taper and a very substantial barrel tip. For the most part, it played like Promark’s standard 5A, but that jumbo bead really affected both sound and response. On every cymbal I tried, the TX515W gave me a surprisingly dark attack with a healthy wave of wash underneath. It was an interesting sound that didn’t recall anything I’ve heard from other sticks in my bag. That whopper of a tip also pulled a ton of sound out of toms at any tuning. Natural, medium strokes produced top heavy notes with extra attack and a quick bottom. That’s not to say that the resonance was truncated or choked in any way, but that the stick seemed to draw out more slap than sweetness. It proved to be the perfect sound for heavy music (as anticipated) in that I got a big, powerful punch from each drum that didn’t occupy too much of the precious space needed for other instruments. Like the Portnoy model, Jordison’s stick seemed to favor a more controlled response as opposed to the rapid rebound of Phillips’ whip. I like a little more of that rebound in a stick, but I understand how important that control is when navigating lightning fast, hammer-heavy figures. When you’re shredding at 220 bpm, the last thing you want is a stick that jumps off the head a little too quickly and flies out of your hand. As anticipated, I really enjoyed checking out these three Autograph Series sticks that, truthfully, I may not have otherwise. Each model offered a little more insight into how design changes affect feel and response, and also served a clear purpose that I found to be mostly in-line with my expectations regarding the player’s style. I really didn’t find any “flaws” with these sticks. They were all strong, durable and comfortable, with each benefiting the needs of a particular style of play. And, that is one of the great joys of checking out artist model gear – it offers a different perspective on those ideas we may be overly certain are good, bad, right or wrong. It reminds us that different players have different needs, and it shows us that there’s a chance we’re not even totally in touch with our own needs. Heavy handed, I know, but I think it’s an important thing to remember when thinking about how you play the instrument. Great review! I have an older pair of the Joey Jordison sticks in my collection. He had his blood put in with the ink they used for the graphic on the stick! Crazy! Look forward to reading more from you.